Reminds you of the smell and taste of fresh and undamaged olive fruit, harvested at the optimal ripeness of the olives. Oil extracted from ripened olive fruits. There is a light aroma and a sweet taste. Oil extracted from olives that are still green. Oil that recalls the smell of apples. Olive oil taste reminds you of the aroma of freshly harvested green herbs. Oil extracted from green olives or green olives mixed with their fresh leaves. Olive oil extracted from olives that have just started to ripen. Might be advisable to pass on it depending on the bitterness level. An adjective specific to olive oil extracted from green olives. The peppery taste comes from the high level of phenol present in the oil. This indicates healthy olive oil. The taste reminds you of green or dried almonds. 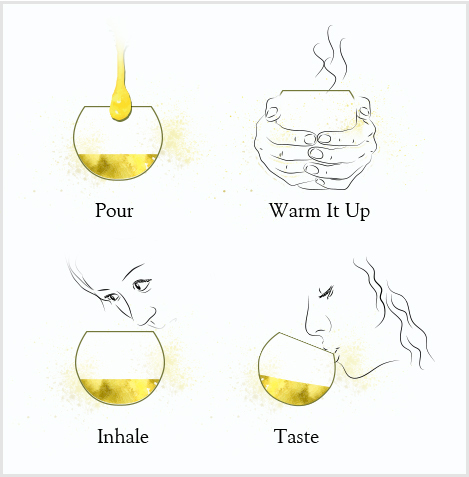 Alternatively, the aromas and tastes listed below indicate quality flaws and issues with the olive oil you are tasting. The reasons behind these unwelcomed flavours could be bad agricultural practices, wrong harvesting techniques or suboptimal storage, to name a few. The olives are polluted with soil and were not properly washed before pressing. Olive fruits can be damaged by the olive fly. If so, the oil will smell rotten and putrid and have a highly acidic taste. Dry oil results from the pressing of crusty olives. Olive fruits can rot if they are not freshly pressed after harvest or are stored in inadequate conditions. They could also have been left in a highly moist environment for a long period of time. Vinegary notes are caused by the production of acetic acid after the fermentation of fruits if the latter were not stored properly. Olive fruit was piled for a long period of time or filled in bags which leads to fermentation.